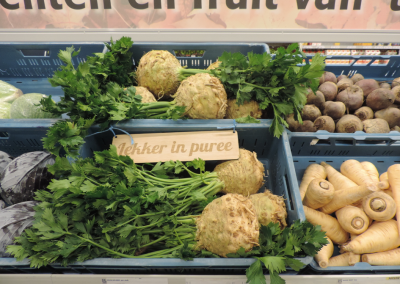 Similar taste, different impact: nudging shoppers towards vegetarian alternatives in the supermarket. The production of meat yields a high environmental impact compared to more sustainable alternatives, like plant-based products. 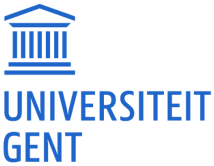 However, although intentions to lower meat consumption among consumers are high, a gap between intentions and actual behavior is observed (attitude-behaviour gap). Furthermore, vegetarian products are often less accessible for the regular consumer in comparison to meat products. 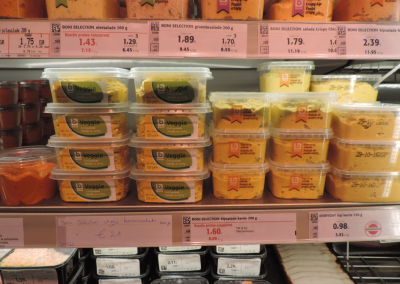 For example, vegetarian products are generally placed in dedicated shelves (next to other vegetarian products), which are more likely to be skipped by the average consumer. The aim of the intervention was to increase the sale of vegetarian products, by placing them next to their meat-based substitute (as a duo). Consequently, by increasing the accessibility of vegetarian products flexitarians (i.e., no full-time vegetarians) were stimulated to replace the meat product by the plant-based alternative. 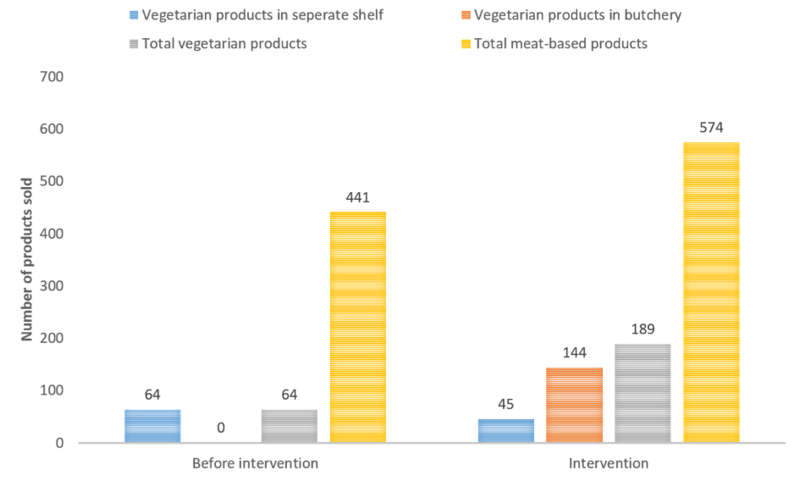 Considering that vegetarian products were rather new and unknown to the target sample, the sales of vegetarian products were additionally promoted by taste-samples. Samples were used to lower prejudices and food neophobic reactions towards these novel products. Three popular bread spreads (spicy minced meat, chicken-curry spread, baloney) were used as meat target products. The plant-based alternatives were spicy carrot spread, curry spread and vegetarian baloney slices: their direct counterparts. Originally, these products were sold in the department of fresh foods (fruits, vegetables, eggs, cheese, ….) on a separate shelf, together with all the other vegetarian products. 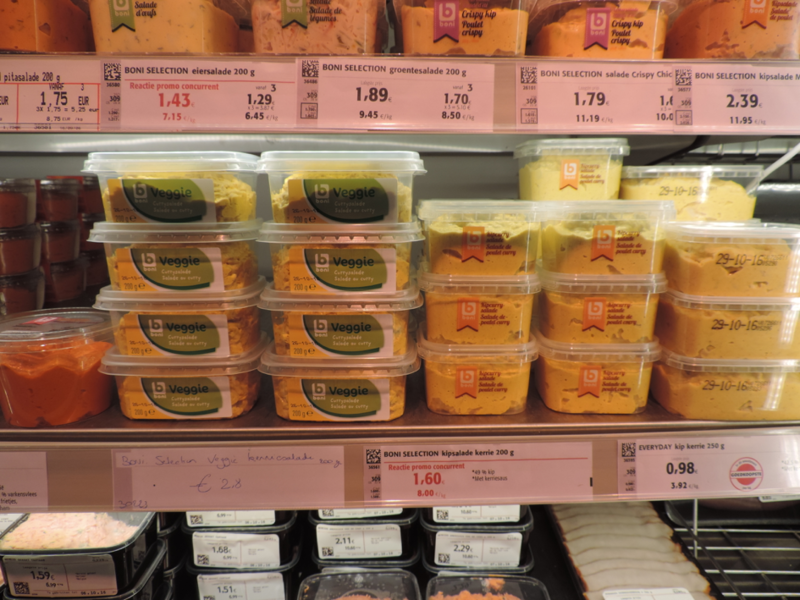 During the intervention period of one month in a store of a large Belgian retailer, these three products were not only offered in the vegetarian section, but also in the butchery in the bread spread section next to the other meat products. As we used separate identification numbers, we were able to categorize the purchase records by point-of-purchase (vegetarian section vs. butchery). Purchase records of the month preceding the intervention served as benchmark. Additionally, there were always samples of one of the products to taste. The three products and substitutes were placed on eye-level to ensure that the intervention would generate enough attention. Furthermore, they were placed according to consumers’ mental perceptions to minimize cognitive load. A pre-test showed that consumers associate vegetarian products more with ‘left’, and meat-based products more with ‘right’. 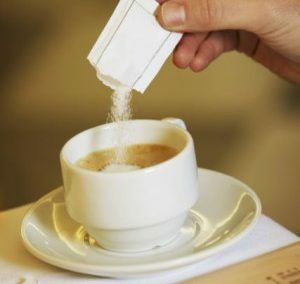 When placed accordingly, cognitive load is minimized which could lead to more reasonable choices (i.e., less unsustainable products). The graph shows the combined sales data of the target products by category and point-of-purchase. The month preceding the intervention, only 64 vegetarian products were bought in the vegetarian section, whereas of the meat-based products 441 packages were sold in the butchery. During the intervention period, the amount of vegetarian products sold was lower in the vegetarian section (45 products). 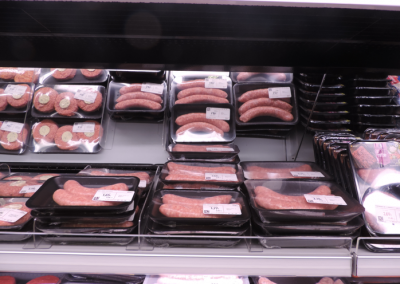 However, this decline of 30% is relatively smaller than the increase in sales by additionally offering the vegetarian products in the butchery (144 products). Taken together, there was a near doubling of the sales of vegetarian products during the intervention period. However, an increase in sales of the meat-based products could also be observed (+30%). This increase could be derived from the better positioning of the product or the general rise of attention for the product (be it meat or vegetarian) by the tastings. This tendency should not be worrying, as the increase in the amount of meat products sold is relatively smaller than the additional sales of vegetarian products. Moreover, the share of the vegetarian products sold compared to the overall sales (vegetarian and meat products) almost doubled in the intervention period from 13% to 25%. By placing the vegetarian alternative right next to the meat-based counterpart, we have found an effective way to reach a new audience: the flexitarian. By placing vegetarian products on the left of the more familiar meat product, purchase behavior will increase among flexitarians. Tastings are a (temporary) helpful means to introduce vegetarian products, as they are new for most of the customers. Increasing the accessibility of vegetarian alternatives is an important nudge towards a more sustainable consumption pattern.